Any readers of my past reviews may have me down as a dyed-in-the-wool Spec-chum. That I cannot deny – not would I ever wish to. But I have a confession to make: I may, in my youth, have... dabbled with other machines. Primarily, I am talking about our friend the C64, of the colourful graphics and (comparatively) 'rocking' SID chip. 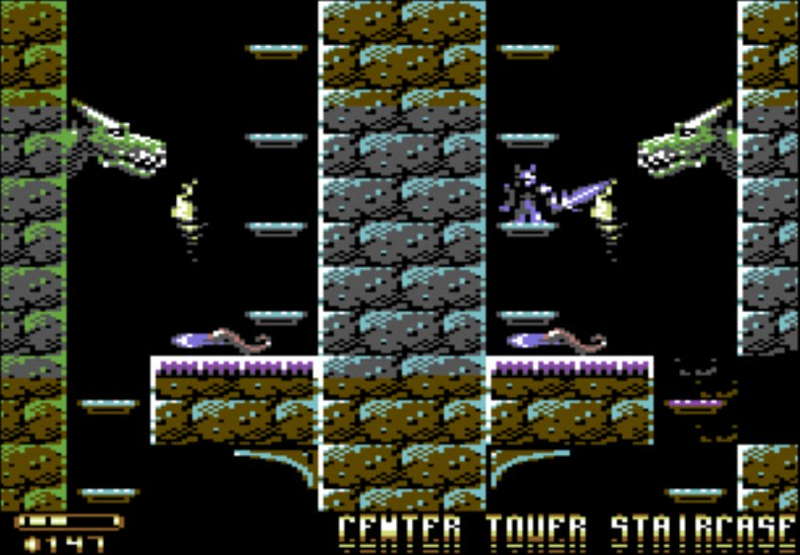 I have been impressed by the quality of new Spectrum games I have encountered recently, but the C64's Knight 'n' Grail from Wide Pixel Games occupies a higher plane. In terms of graphics, audio, game design, storyline, gameplay, general polish – and any other factor you might care to mention – it is exceptionally good. I believe it is important to the game-playing experience for the whole package to be excellent, and that starts with the packaging, instructions and storyline. The first two are difficult to experience if downloading a game and playing on an emulator, but Knight 'n' Grail excels with its powerful and perfectly pitched story that quickly transports you to the action. The scene is expertly set for the beginning of the game, but there is much left unsaid that you will discover as the game unfolds. The narrative voice continues into the game, with tablets of stone offering direction and warnings throughout. 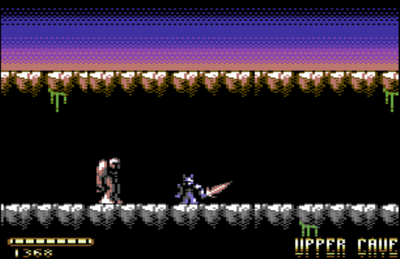 Knight 'n' Grail is a huge, detailed arcade adventure with the emphasis firmly on action. 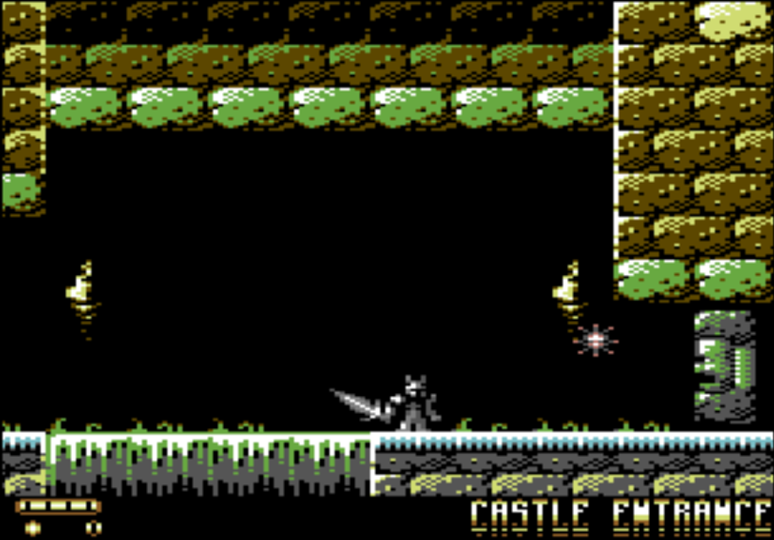 The game's world draws the player in and enthralls from the very beginning, as your knight approaches a foreboding castle. A gloomy score sets a sombre mood before the game's sound effects come to the fore; the game switches between the two periodically in a way that enhances the atmosphere. Your character sprite is well-drawn: a squat, chunky armoured knight with a frankly massive sword that he appears to drag behind him, poised to strike. Gradual exploration and swift despatching of enemies is the order of the day as the castle is inhabited by all manner of acid-spitting snakes, pesky imps and fireball-launching stone heads. Contrary to my expectations, your knight launches his blade at enemies with a tap of the fire button, though at this stage your range is limited. 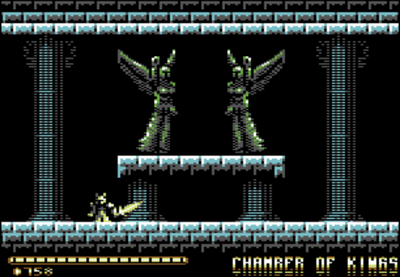 You will encounter a number of locked doors blocking your path; the game revolves around finding keys and other objects, weapons, and special powers that allow you to progress. The game is very playable with generally slick controls but I did find that jumping was a little awkward on the occasions when it needed to be just right. 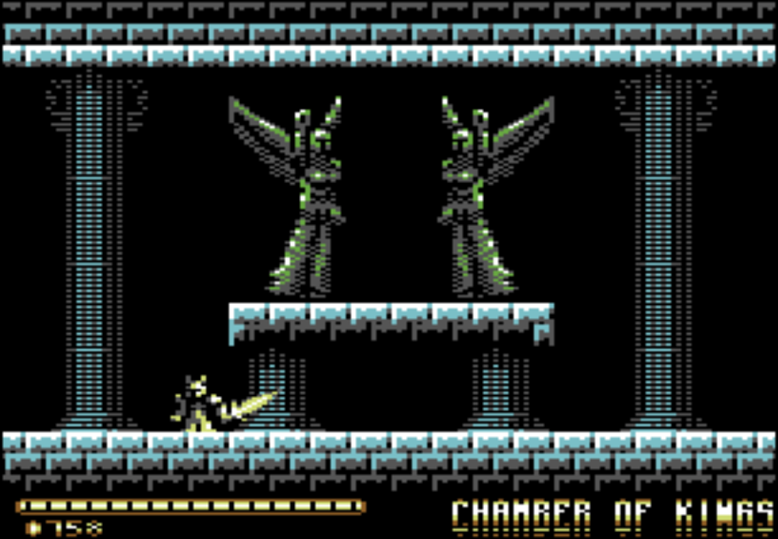 The levels, enemies and backgrounds are very well realised and as you get further in the game the scene changes to mines, sewers, mountain passes, and dungeons. Each level is populated by hostile creatures from ghoulish skeletons that throw their heads at you, to menacing wyverns, to lumbering golems, to unidentifiable creeping slimes. It's creative, atmospheric, and beautifully designed. There's a puzzle element in Knight 'n' Grail which will involve you travelling backwards and forwards through the game world, though thankfully the 'Well of Wishes' will transport you from one end to the other. You must collect new swords and armours, each named after an element (e.g. Sword of Water or Armour of Lightning) which confer different powers, immunities, shooting styles and ranges on your knight. This adds an interesting variation to the game, where you must select the right weapon for each enemy, and at certain times, select the right armour just to survive. Each new power you earn will allow you to explore new parts of the game – like the Power of Woodpecker that lets you smash through walls, or the Power of Ostrich that lets you jump higher. To truly succeed, you will need to take on some tough creatures: a huge wyvern is the first guardian you must defeat. It towers over you and showers you with fireballs in between fits of maniacal laughter. Quite scary, actually – but if you have the right armour to protect you, you should be alright. The game ups the tempo at these points with a dramatic soundtrack (which adds to the stress of the situation!) Throughout the game there are a number of equally imposing and impressive guardians; one minor quibble is that the challenge in defeating them is somewhat lacking as it is often straightforward to identify a safe-spot launch your attack. As you explore, the game automatically draws a map which you can reference at any time. I have to say that without this excellent feature I would not have had a hope of completing the game as it really is labyrinthine and immense. The object of Knight 'n' Grail is to retrieve the grail of the title and allow your beloved to drink from it to release her from the curse that has cruelly turned her into a reptilian monster. When you eventually find the grail – in a wonderful twist – you need to ensure you have explored the entire game and found every item. If you haven't, your efforts will be in vain and you will experience a tragic failed ending. Luckily, at this point you can pick up the complete game map, which enables you to see the areas of the game you have yet to find. 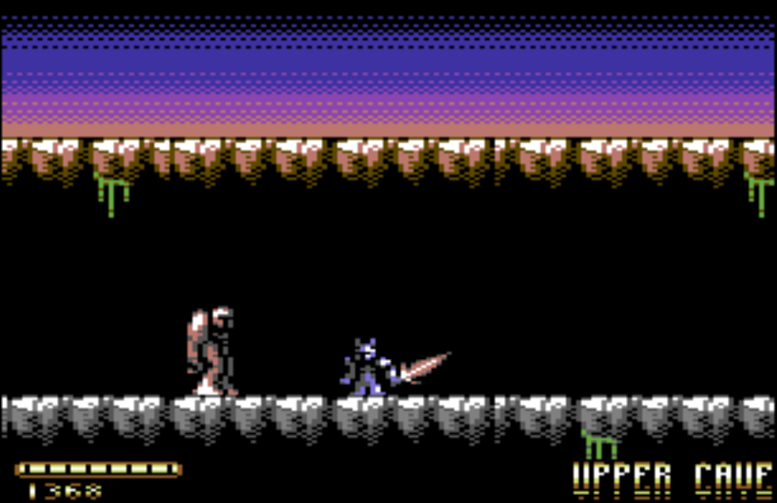 Knight 'n' Grail has great depth and variety to keep the player entertained. There is a real sense of achievement as you progress, and you will want to keep going until you have completed your quest. I absolutely recommend this game, and the only criticism I can make is that I found the challenge waned a little as I got closer to the end. The main reason for this is that you can collect power-ups that increase your maximum energy from three hits ultimately to over sixteen hits. Coupled with this, there are several 'Runes of Rebirth' which not only allow you to save your game position (an essential feature), but also maximise your energy. 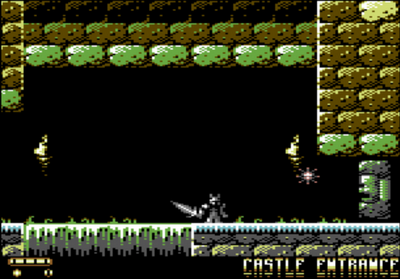 Some later passages in the game are also easier than parts of the castle, when the game should be on a gradual upward difficulty gradient. This is a fabulous game and, as a self-confessed Spec-chum, it pains me only a little to wholeheartedly recommend it! 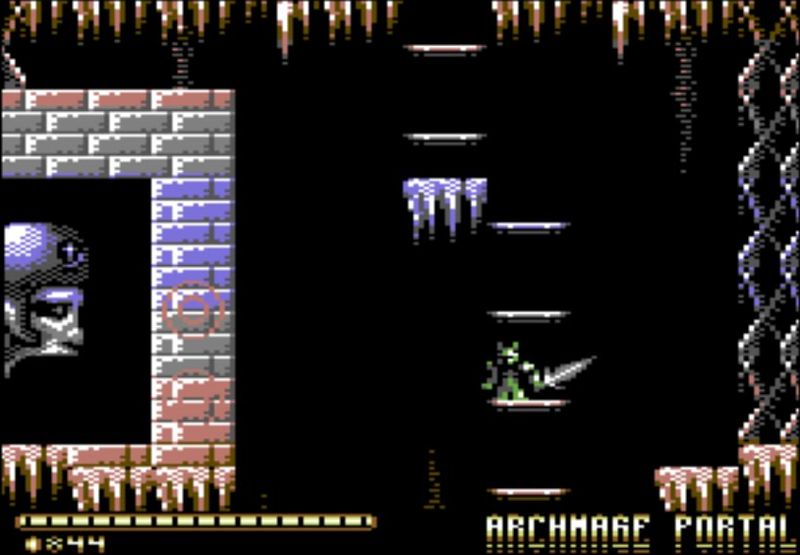 It uses the full capabilities of the C64 and in terms of graphics and sound it is spot-on, but its real strength is in the brilliant game design and its enduring depth – Knight 'n' Grail had me glued to the screen from start to finish. 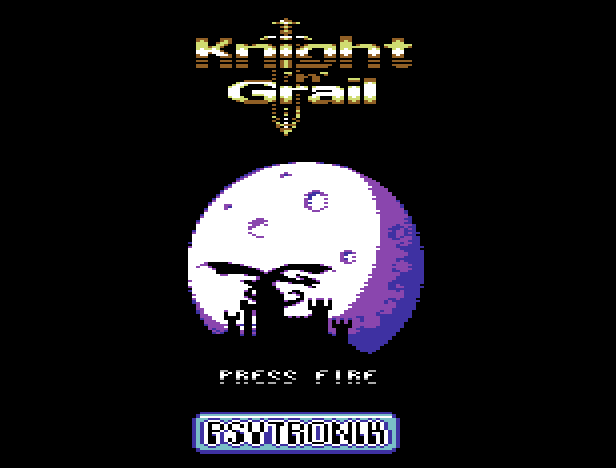 Knight 'n' Grail is available to buy from Psytronik Software as a digital download (£1.99), budget disk (£8.99) or premium disk (£12.99). There are of course less-legal ways in which to obtain a copy of the game, but here at RGCD we firmly believe that Wide Pixel Games and Psytronik deserve your support! Buy the game here (from Psytronik Software). Bought and played this a bit a while ago, certainly recommendable to anyone reading this who hasn't already bought it. It's combined with a tune from the XBOX Ninja Gaiden. I hope you don't mind linking the EP here! It would be nice If someone released this in cartridge format.